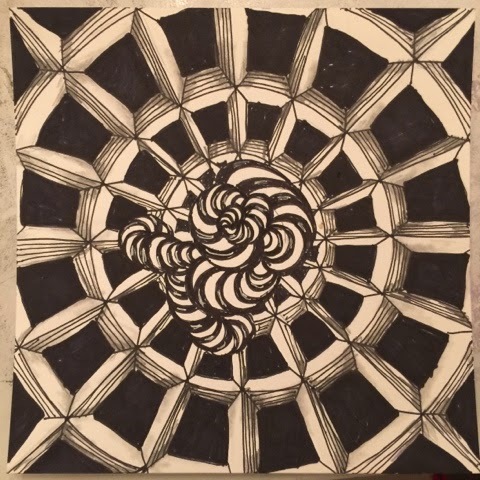 This is my first entry in the Diva's Zentangle Challenge. In this Challenge (#217), we were to use the patterns Dex and Bunzo. My original thought was to create a tunnel-like structure with Dex and have Bunzo snaking through the center. The tangelation required to do that was too much work, so I took the easy route, which was to flatten the overall structure. Take a look at how other participants used these patterns here. Dex and Bunzo? Sounds like two characters in a science fiction m/m story that takes place on the planet or space ship Zentangle! I like this pattern stuff. You've got yourself a very interesting blog here, Ms Kari. Lol, Deedles! Sounds like a fun story! Maybe we can get Thorny to write it. That would be so very cool, Angelcake! You, of course, would have to do the cover art, after all, it is your picture! This piece does look science-fictiony. Like a view of deep space from inside a space ship, and the bunzo are little alien life forms congregated at the apex, waiting to arrive at their destination. hahahaha! The shading is so well done. Impeccable, giving Dex an amazing depth. Just yummy! Thank you so much HeidiSue! I tend to use the gridded patterns often because they are the easiest to transform. Thank you for leaving a comment! What an interesting way to use Dex. Love it! Thank you, Christina! This was fun! I don't know a Dex from a Bunzo, but this is too cool!! Lol, Sharon! There are so many patterns! Thank you for leaving a comment! Well, Yukari, welcome to the Diva Challenge. So very happy to see you here. I love what you did with the duotangle. That Dex is so dramatic in the round! Thanks, Jean! Hope to do it again next week! Will definitely check it out! Thanks Diane? very nice how you combined this 2 tangles....to me a it was a challenging challenge. Welcome! I really like the dark background behind the Dex wheel. It sets it off beautifully. It looks like the deck of a ship sailing through space. Lovely! this is stunning! it really does look like something from a spaceship escape pod. the design is so well laid out! Lovely tile! Great idea to use Dex in circles! Very original and well done. Hope to see you here again next week! Love your first entry.... watch out, it's addicting! But in a good way! Love your piece! The Dex is very well done (I wouldn't dare to attempt it in a circular format) and all the Bunzo centered in it is just plain fun. I know what you mean about Bunzo, it's one of my favorite tangles and when I add Bunzo, it IS hard to stop drawing them. They make me laugh. Very stunning work. That looks so nifty, Kari!! !